Question: what do David Gilmour (Pink Floyd), Billy Corgan (Smashing Pumpkins) and Jack White (the White Stripes, The Raconteurs) have in common? Answer: they are all avid users of the Electro-Harmonix Big Muff pedal and a lot of their recordings would not have been the same without the raunchy, dirty, gritty, fat tone of “the muff”. I will demonstrate in two videos the tone of the Big Muff but first, let’s go briefly over the troubled history of this famous distortion pedal. The Big Muff originated in the 70s. It is often called a “fuzz” but I rather think it is a distortion pedal as it is quite a departure from the fuzz pedals of the time. Two versions came out in the 70s: the “triangle” Big Muff (triangle because of the shape formed by the knobs) and the “Ram’s head” Big Muff (because there is a little picture of a ram on it). The maker of the Big Muff, Electro-Harmonix, went bust in 1983. Mike Matthews, its founder, went on to build Big Muff pedals under the Sovtek brand starting in the early 90s (on a side note, Sovtek had a killer line of amps at the time). Electro-Harmonix were “rebooted” later on in the US and they are now very much alive. Their current range of pedals is huge. If you are looking for a brand new Big Muff, you will have to go for the current Big Muff Pi or maybe the little Big Muff which has a smaller casing: those are closest to the “muff tone”. 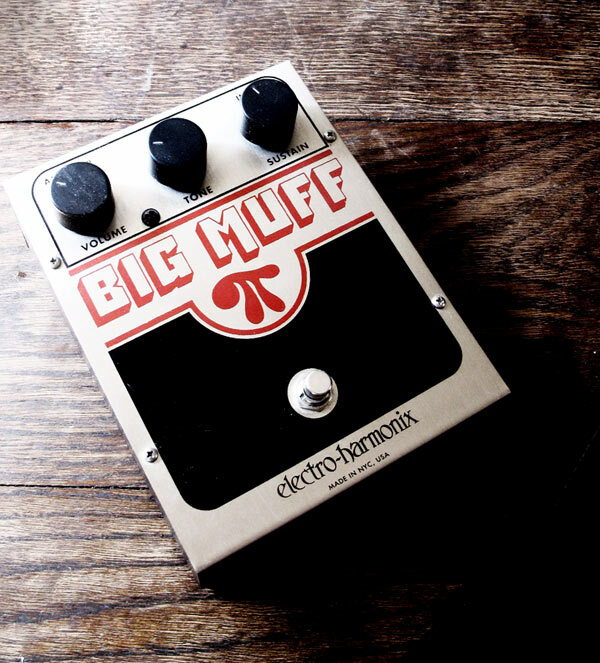 A lot of other pedals currently made by Electro-Harmonix have “Muff” in their names, like the Metal Muff, but they sound quite different from “THE” Big Muff. The connoisseurs think that the current range of Big Muff is quite inferior sounding to the 70s gear and even to the Sovtek Models. This explains why a number of clones exist like the Ron Sound Hairpie, clone of the US 70s stuff or the Absolutely Analog Green Russian, clone of the Sovtek models. As to the BYOC Beaver, it is a highly regarded kit for you to build your own 70s US Big Muff clone (good luck to get it outside of the US). If you would like a much more detailed history of the muff, check out this post on Gilmourish. It also tells you which Big Muff version David Gilmour used on the different Pink Floyd albums and tours. You can also visit this awesome site for more details and schematics. First of all, let me tell you that the Big Muff is an animal that is difficult to tame. You might try it and think that it sounds really harsh. Know that you really have to use the right amp and will have to play quite loud: don’t think you will get a big smooth tone out of a Big Muff at low volume, especially if you use it on its own. Used with Humbuckers, the tone goes into “big indie riffage” territory. For this video, I use only the Big Muff with my SG and my little 5W all tube Fender Champ miked with a Shure SM-57 (some reverb was added afterwards in Cubase). The settings on the muff were VOLUME at 10 o’clock, TONE at 10 o’clock and SUSTAIN at 11 o’clock. In case you are wondering, the Big Muff I use is a standard current US Big Muff Pi model, no fancy clone or vintage model. As to the Stratocaster, it is a Custom Shop American Classics Stratocaster with Kinman AVn Blues Pickups. 1974 Fender Silverface Champ (BASS on 10, Treble on 2.5, Volume on 3). Dynacomp settings: OUTPUT at 10 o’clock, SENSITIVITY at 10 o’clock. An interview of Billy Corgan recalling his encounter with the Big Muff.